NERW's big 2004 Year in Review - now available! Click here! *It was a quiet week stateside (which was convenient, seeing as how we spent it visiting stations in New York City and Philadelphia instead of chained to the keyboard), so we'll start things off in CANADA this week. And being that it was a quiet week in the major cities, we're left to kick off this week's report way up in Port Elgin, Ontario, a quiet - and very nice - little town on the shore of Lake Huron. Until now, broadcasting in Port Elgin has meant CFPS (1490), the 1000-watt simulcast of Bayshore Broadcasting's oldies CFOS (560) over in Owen Sound, 20 miles or so to the east. Now the CRTC has approved Bayshore's application to take CFPS dark, replacing it with a new adult contemporary station on 97.9, with 3800 watts of power and 126 hours a week of local programming for a community that's had almost none until now. Meanwhile over in Kingston, the CRTC denied an application from Corus' oldies CFFX (960) to add a 50-watt FM relay on 93.7, saying that CFFX's claim that its AM signal didn't penetrate downtown buildings well was typical of all signals in that area. *A developing story in NEW YORK finds state attorney general Eliot Spitzer issuing subpoenas to Entercom, Infinity and Clear Channel over allegations of payola. You'll recall that those allegations forced WKSE (98.5 Niagara Falls) PD Dave Universal out the door at that Entercom station, and reportedly led to the departure of Infinity Rochester programmer John McCrae (a story that's still never been reported by Rochester's daily newspaper; perhaps Spitzer's involvement will finally get them to play months-late catchup, though we somehow doubt it.) And Clear Channel just showed the PD of its Chicago gospel station the door over similar allegations. Particularly in light of Spitzer's well-publicized higher political ambitions (he's running for governor next year), this story is far from over. Downstate, WFKP (99.3 Ellenville) indeed flipped from its "Cupid" stunt to AC "Lite FM" on Monday, sharing music and jocks with Clear Channel sister WRNQ (92.1 Poughkeepsie), though it's not a straight simulcast. Over in Port Jervis, Jim Morley's PJ Radio puts WTSX (96.7) and WDLC (1490) into a one-year LMA with Sunrise Broadcasting, the owners of WGNY-FM (103.1) and WGNY (1220) in Newburgh. WTSX keeps going with oldies as "The Fox," but WDLC drops its WTSX simulcast and instead begins simulcasting a different oldies format with WGNY as "The Tri-State Oldies Station." In Syracuse, midday guy/assistant PD/MD Ryno is out the door at Citadel's WAQX (95.7 Manlius), leaving an even bigger hole to fill at 95X, where Howard Stern was pulled off the air late last year. Will the station continue as a rocker, or is change in the wind on James Street? Syracuse Community Radio has added an AM signal to its arsenal; in addition to low-power WXXE (90.5 Fenner), which hasn't even been on the air the last few times we've been in the area, it's now transmitting on 1640 in the vicinity of its Euclid Street studios. *In NEW JERSEY, Friday night indeed brought the end of "B-98.5," WBBO (98.5 Ocean Acres), as Press Communications replaced the hot AC there with modern rock "G Rock Radio," in a new simulcast with WHTG-FM (106.3 Eatontown). Matt Knight moves over from the old WBBO airstaff to do nights on the new "G."
*There's a new FM signal coming to northwestern PENNSYLVANIA - eventually. The FCC approved Dana Puopolo's petition to add 92.7A in Lawrence Park, otherwise known as the east side of Erie, and not to be mistaken for the "Lawrence Park" in the Philadelphia suburbs. Because there's a 100-kilowatt signal coming from CJBX in London, Ontario, right across Lake Erie, the new Lawrence Park signal will be limited to 225 watts at 100 meters - barely more than your garden-variety LPFM. But we bet that won't stop people from lining up to bid for the signal when it's put up for auction, which probably won't happen for at least a year or two. Route 81 Radio is changing direction at WHYL (960 Carlisle); the station dropped its standards format last week and flipped to talk. There's a new PD at country WRBT (94.9 Harrisburg), as Joe Kelly moves east from his previous job as music director/APD of WNCI (97.9) and WFJX (105.7 Hilliard) in the Columbus, Ohio market. Kelly replaces Shelly Easton, who's now operations manager at the Citadel cluster in Allentown. There's a PD opening down the road from Harrisburg, as WQXA-FM (105.7 York) parts way with PD Claudine DeLorenzo after a decade or so. And there's an APD/MD/afternoon opening in the market, too, as WWKL (92.1 Palmyra)'s Lucas leaves the biz. *The illness of Air America host Randi Rhodes (she's recovering from abdominal surgery) is giving Jerry Springer some exposure at several of the talk network's affiliates, including CONNECTICUT's WAVZ (1300 New Haven), where Springer's being heard in Rhodes' 6-9 PM time slot. He's also on in Boston on WXKS (1430 Everett)/WKOX (1200 Framingham), where he's expected to remain on the schedule - somewhere - after Rhodes returns in a few weeks. *A postscript to the saga of North American Broadcasting, former owner of WALE (990 Greenville) in RHODE ISLAND: the company's now bankrupt, with its last remaining station, KFNX (1100 Cave Creek AZ) in the Phoenix market, up for auction March 31. The bidding starts at $3.6 million, and all the juicy dirt's available for public inspection at www.1100legal.com. On a happier note, WBRU (95.5 Providence) celebrates its 40th anniversary next February, and it's never too soon for the organizers to start looking for alumni of the powerful Brown University outlet. There's a web page up at http://bracksco.com/wbru, and alumni from the early years (1963-1975) are invited to contact John Leistritz '65 at leistritz@cox.net for information about a planned reunion in June. *The FCC grants the addition of 98.9A in Adams, MASSACHUSETTS to the table of allocations - but it'll be years before the frequency goes up for auction and anything gets built there. Ed Perry's not only the owner of WATD (95.9 Marshfield) - he's also trying to be the defender of journalists' right to cover stories in the Commonwealth of Massachusetts. Perry was arrested for disorderly conduct, trespassing and resisting arrest back in 2002 for attempting to interview a security guard at the Hanover Mall, and even though the charges were later dropped, he's suing the mall's former owner and its security company for violating his civil rights. Perry says the mall owners and the security company have tried to settle with him, but he's spent more than $20,000 in legal fees in an attempt to prove a point - that reporters should be able to cover stories (a report of a carjacking, in this case) without fear of arrest. In Boston, Jason Wolfe gets a promotion - the WEEI (850) PD is now Entercom's director of sports programming. Speaking of WEEI, the station just signed a deal that will put Boston College sports on its signal and that of sister WRKO (680) for the next five years. The move of WOQL (97.7 Winchendon) to a new tower site across the state line in NEW HAMPSHIRE has cleared the way for channelmate WBOT (97.7 Brockton) to apply for an audacious Boston move-in. The Radio One R&B outlet moved once, a few years ago, from the tower of former sister station WBET (1460 Brockton) to a tower in Abington - but now it's got enough spacing from WOQL to propose a move to Great Blue Hill in Milton, where the WGBH (89.7 Boston) tower overlooks Boston to the north. 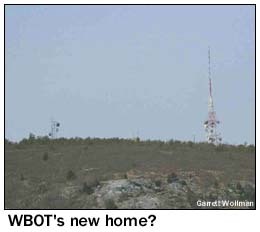 WBOT would run 2 kilowatts from 173 meters above average terrain from the Great Blue Hill site (it currently uses 2.7 kW/150 meters from Abington), with a directional antenna putting a null toward Winchendon - but with much better line-of-sight coverage to greater Boston. And it turns out that WBOT's proposal isn't even the only audacious Boston move-in on the FCC's docket, as WFNX (101.7 Lynn) applies to move right into the heart of Boston. Some background here: the former WLYN-FM began on the side of the WLYN (1360) tower in Lynn proper, but for the last couple of decades or so, 101.7 has broadcast from the site above Malden Hospital that was once home to WNAC-TV (Channel 7). That produced a decent signal in the suburbs, but with just 1650 watts at 449', the 101.7 signal has never done a good job of penetrating the RF haze in the middle of Boston, a problem WFNX tried to rectify a few years ago with the addition of translator W267AI (101.3) on the Hancock tower in the Back Bay. But now WFNX is trying something bigger: it's applying for a new directional signal with 1690 watts at 627', high atop One Financial Center, the downtown skyscraper that's also home to WHRB (95.3 Cambridge) and WERS (88.9 Boston). WFNX's directional antenna (mounted a few feet above WHRB) would put a pretty deep null towards WCIB (101.9 Falmouth) and WWBB (101.5 Providence), and it would barely cover the city of license (still Lynn!) with the requisite 70 dBu signal. *The PD chair is spinning again at WEQX (102.7 Manchester) up in VERMONT, where Tim Bronson's out. The Albany-market alternative station is now looking for someone to fill Bronson's PD and midday duties. Didn't find one under the tree this year? That's OK - we've still got plenty, and we're shipping them out daily. This year's calendar begins with WSTW/WDEL in Wilmington, Delaware on the cover, ends with Sutro Tower in San Francisco on the inside back cover - and along the way makes stops at WNBF in Binghamton, CFNB in Fredericton, Poor Mountain in Roanoke, KXNT in Las Vegas, WBBR in New York, Gibraltar Peak above Santa Barbara, WDEV in Waterbury, Vermont, WRIB in Providence, WOOD in Grand Rapids, KFJZ in Fort Worth, KYPA in Los Angeles and the top of Chicago's Hancock Tower.